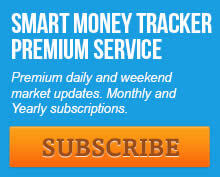 As most of you know by now I believe we are going to see a big surge in inflation this year. As I’ve noted in my previous articles the first leg up in the CRB has run its course and broken the 3 year down trend that’s been in place since 2011. I think it’s time for the second leg up in that inflation. 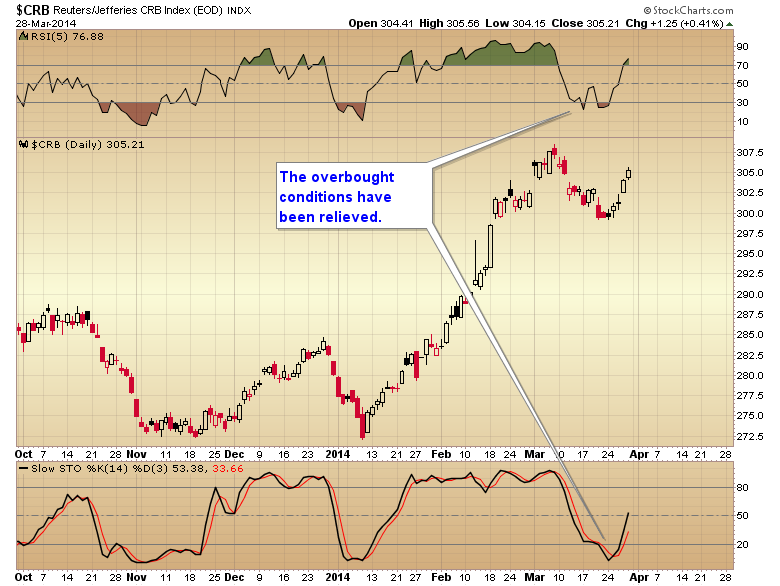 The two-week dip in the CRB has cleared the overbought conditions from the initial surge and I think we will now get one more push to test that 2012 high before commodities experience a more significant pullback this summer to set up the big inflationary spike that I am anticipating to occur during the second half of the year. 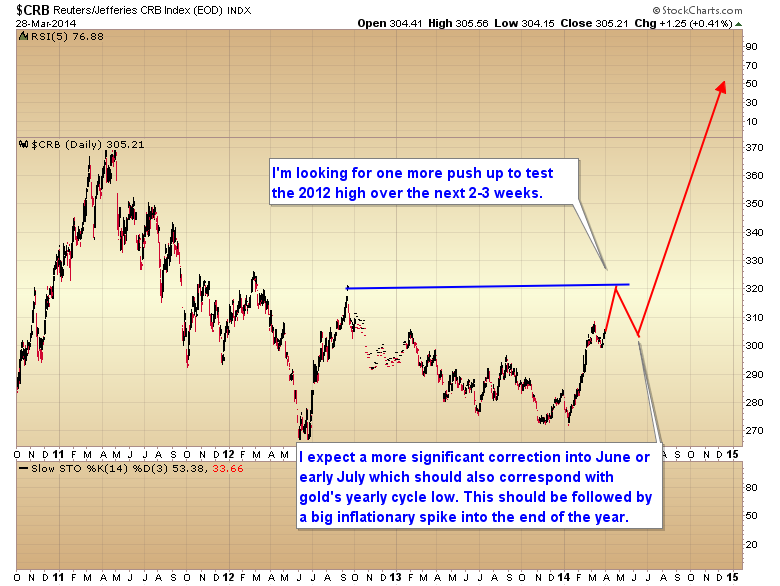 And don’t forget, any move above that 2012 high will turn this three year cycle right translated. The previous three year cycle was also right translated. That is confirmation that the secular bull did not expire in 2009 as some analysts suggest. 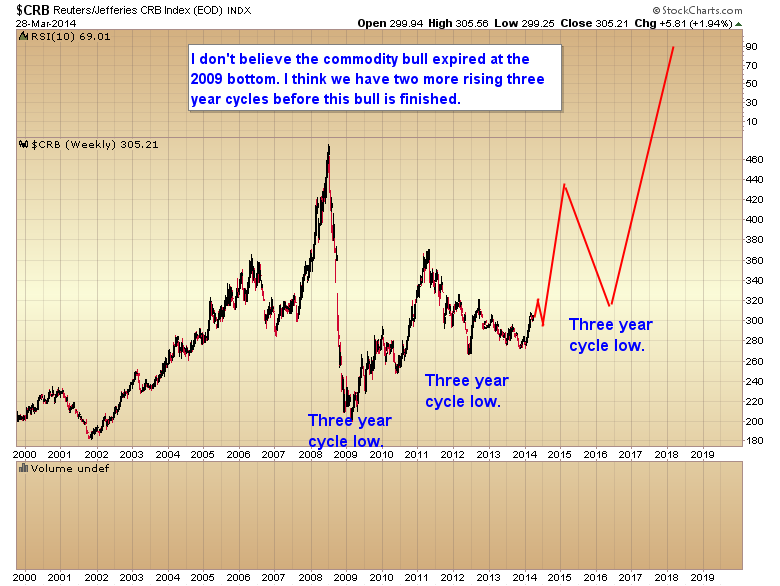 I believe we still have two more big legs up before the commodity bull is done. One should top at the end of 2014/early 2015 and the last leg up should top sometime around late 2017 or 2018. Those that want to trade hard assets should probably stick with general commodities for the next few weeks though and leave the metals portfolio alone for now. As far as I can tell, virtually all of the other commodities are trading naturally and I don’t foresee a 5000 contract dump in the middle of the night to knock the sugar market back down. 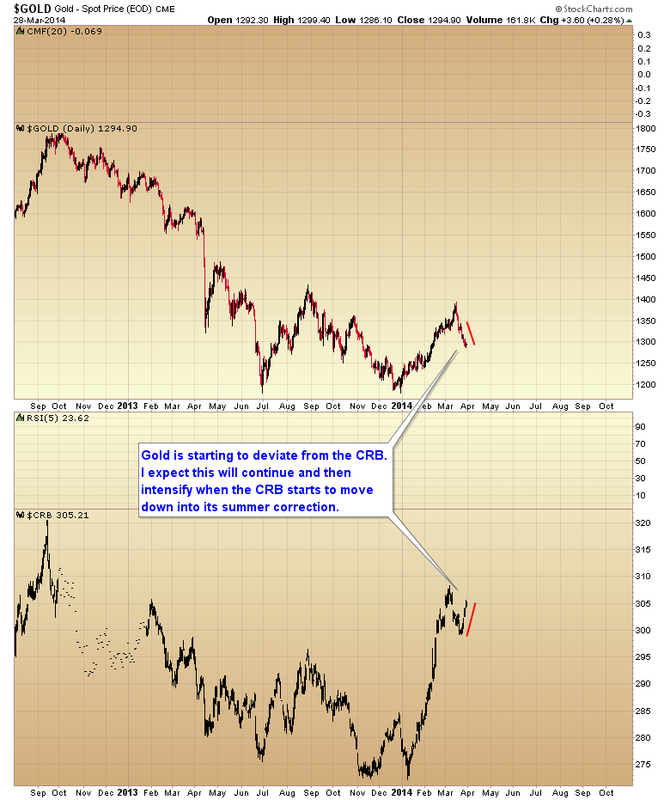 Notice how gold is now deviating from the rest of the commodity sector. I don’t think this would happen in a natural market. 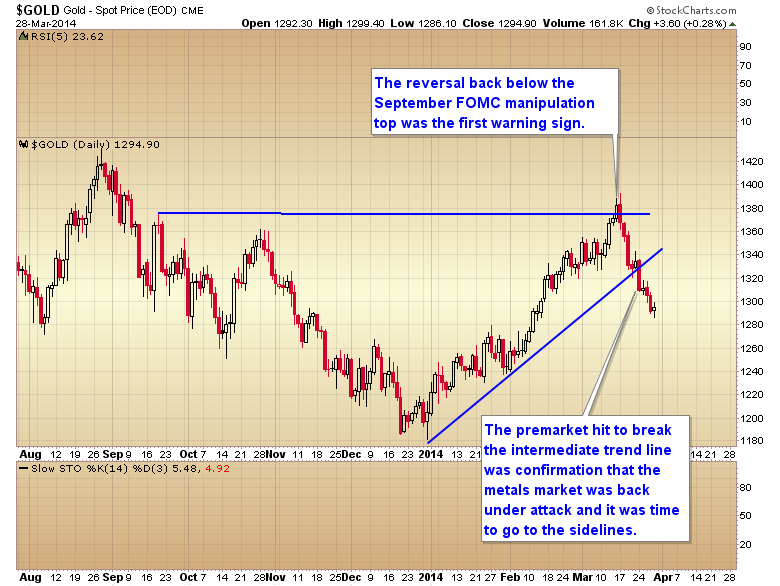 I believe the metals are being set up to take a massive beating when the CRB drops down into its summer correction. During that correction gold will be moving into its yearly cycle low (YCL’s are the most damaging correction of the year for any asset). 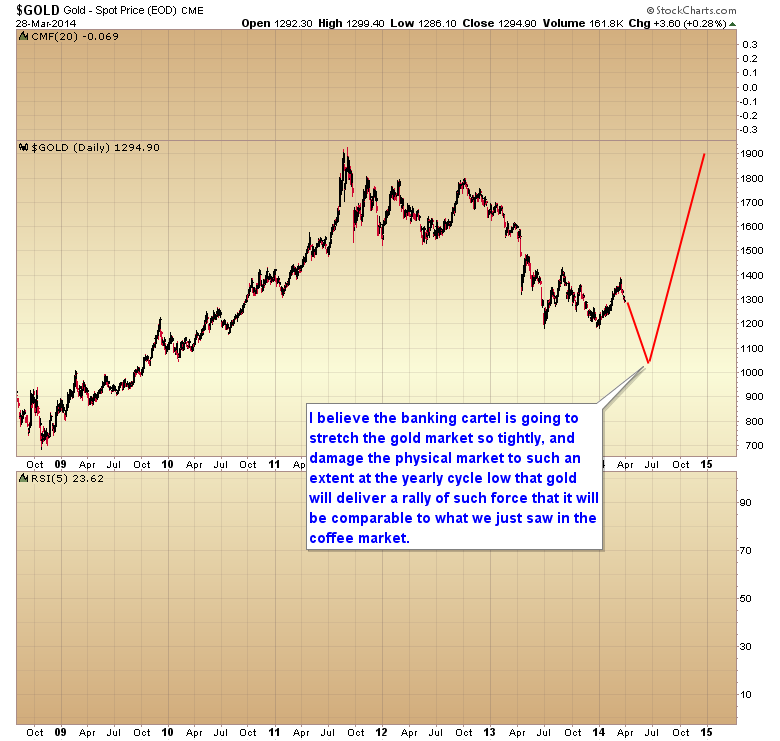 I fully expect the forces controlling the gold market will try to break that double bottom and take gold down to $1050. 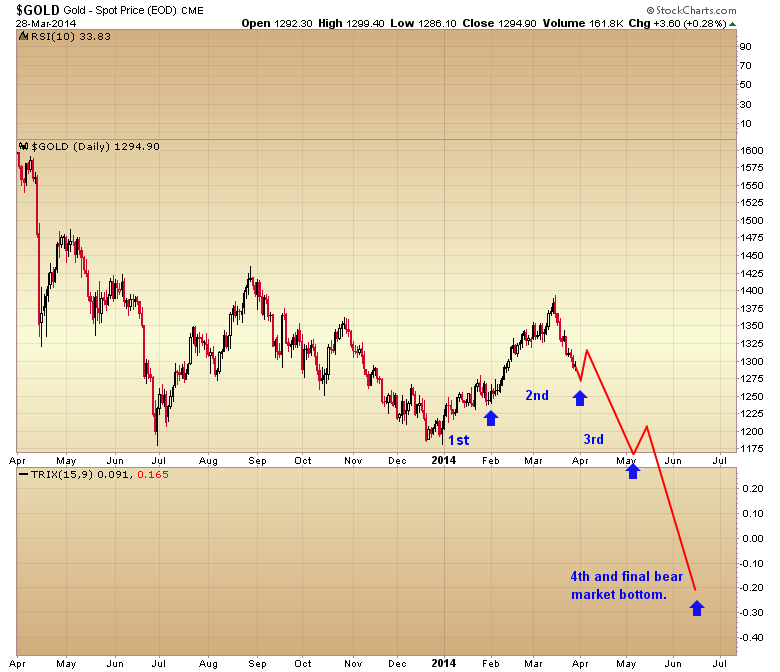 Notice that gold’s yearly cycle is left translated. Left translated cycles more often than not make a lower low. You have to hand it to these guys; they have played the metals market perfectly over the last year and a half. 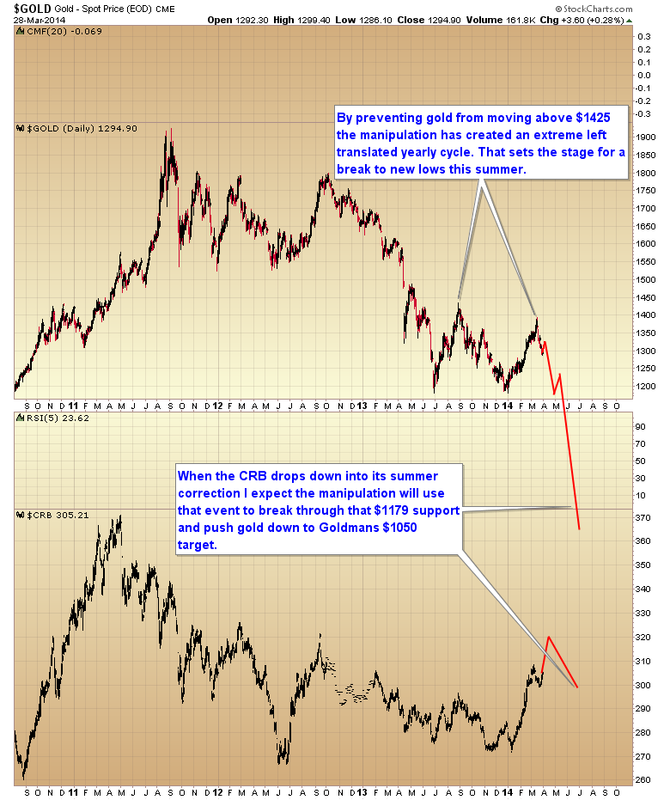 They managed to manufacture a completely artificial bear market, and now that they have turned gold’s intermediate cycle back down they have set the stage to take gold down to $1050 this summer which has been their goal all along. And I think the motivation for this is the same that it has always been. The profit potential after releasing the gold market is much greater from the $1000 level than it is from the $1800 level. Make no mistake the entire purpose of this year and a half long bear raid has been to manufacture a lower D-wave bottom, thereby increasing long side profit potential. In the process they’ve managed to also make some good money on the short side. I think they’ve also intentionally damaged the physical supply side of the metals market knowing that that would exacerbate the rally once the manipulation was released, and the secular trend allowed to resume. Not only are these guys having a banking cartel manufactured lucrative short trade, they have damaged the physical market enough that we will likely see a huge move from $1050 back to $1800-$2000 over a 4-6 month period once the manipulation is removed at the yearly cycle low. 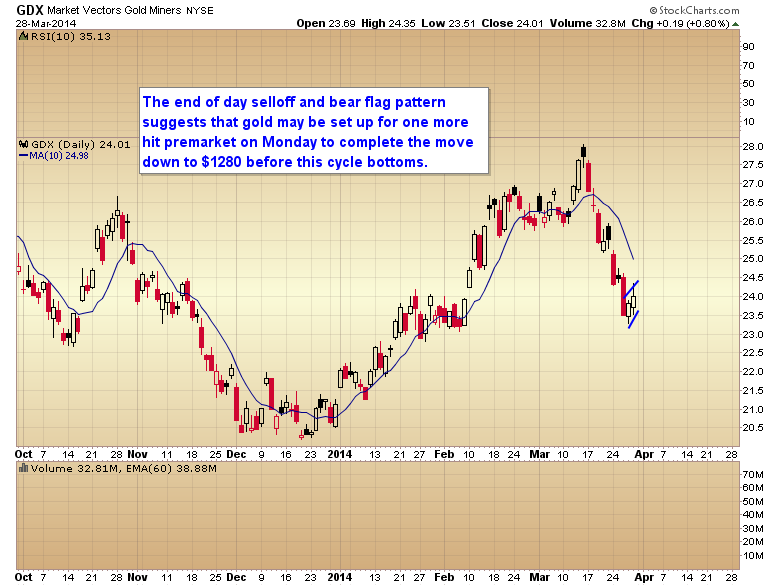 I’m up in the air as to whether or not gold is ready to bounce out of its daily cycle low on Monday. Now that I am convinced the manipulation is back in control of this market I just can’t trust anything to happen naturally. Heck they already broke the natural daily cycle low that occurred last Thursday and have stretched this cycle way past its normal duration. There’s no telling how long they can make this cycle stretch. $1280 is a logical support zone but they may very well break that just to take out all of the buyers that will likely come in at that level. And while the miners did bounce on Thursday and Friday signaling a possible impending cycle bottom, it’s also conceivable that the bounce over the last two days is nothing more than an oversold bear flag that will breakdown quickly. 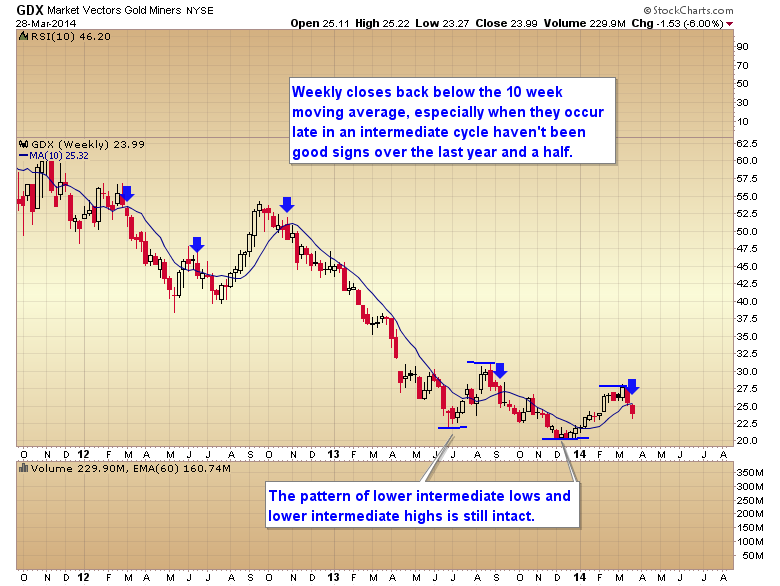 Despite the partial reversal in the GDX weekly candle, the big picture tells us the rest of the story. As you can see any time over the last year and a half that the miners have dropped below their 10 week moving average, especially if it occurs late in an intermediate cycle, it has almost always signaled that an intermediate degree decline has begun. So I wouldn’t get my hopes up that the banking cartel is going to release this market and a third daily cycle is going to recover to new highs. I think these guys are intent on pushing gold to $1050, and I think they probably have it set up to accomplish that this summer. Notice how the mining stocks are still making lower intermediate lows, and lower intermediate highs. The sector needed to move above last August’s high in order to confirm that the bear market was over, and the cartel aborted that move before it could happen. So while I know this is tough to hear, as most of you are gold bugs, I am confident that the banking cartel has a purpose, and that purpose is to set up what will probably be one of the most lucrative long side trades in the metals of this entire secular bull market. Our job right now is to be patient and wait for that yearly cycle low later this summer. I think that low is going to drop at least down to retest $1200, and if the cartel has its way, they will push gold back to $1050 before this is over. This entry was posted in Uncategorized on March 30, 2014 by Gary. This entry was posted in Uncategorized on March 28, 2014 by Gary. This entry was posted in Uncategorized on March 25, 2014 by Gary. This entry was posted in Uncategorized on March 24, 2014 by Gary. This entry was posted in Uncategorized on March 21, 2014 by Gary. The regular premium website has been reactivated. Tonight’s report will be posted there in a few hours. I will have more details on how I’m going to proceed in tonight’s report. This entry was posted in Uncategorized on March 20, 2014 by Gary. First off a status report on the website. I spent about 3 hours on a conference call last night with the developer and transfer agent. The hold up is the subscription files. The original software that runs the subscription plugin is no longer in business so it’s impossible to get a re-install or support for that plugin. We tried to figure out someway to automate the process of transferring all of the active subscription files into a new payment plugin but because of certain restrictions there just doesn’t appear to be any way to do this without losing some critical information along the way. So unfortunately this leaves me with an incredible mess of having to do this entirely by hand. That means I have to sort through 5000 files, figure out which ones are active and which ones are inactive. Figure out who is monthly, who is biannaul and who is annual. Then once I get all of that done we can migrate the active files into the new subscription system. This going to be a tedious process that will probably take at least 2-3 weeks. In the meantime we are going to reactivate the site as is. Everything should still be running fine the only problem is the malware spam links on the subscription page. During this process I’m going to have to assign a temporary password to everyone’s account so that I can get in and check the status of the account. At some point over the next 2-4 weeks you will get an email from me with your temporary password. So if one day you try to log in and can’t, check your email to see if you have been assigned your temporary password (don’t forget to check your spam filters). Sometime this evening the site should go back live and I’m expecting to publish tonight’s report back on the premium site barring some unseen difficulty. 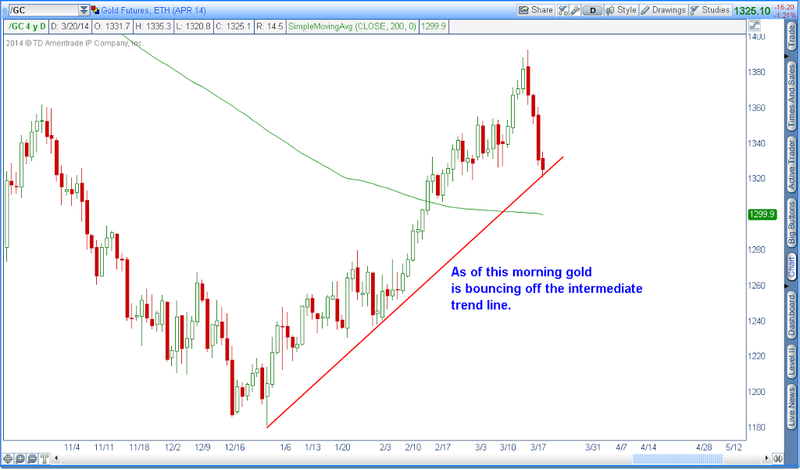 As of this morning gold is trying to bounce off the intermediate trend line. 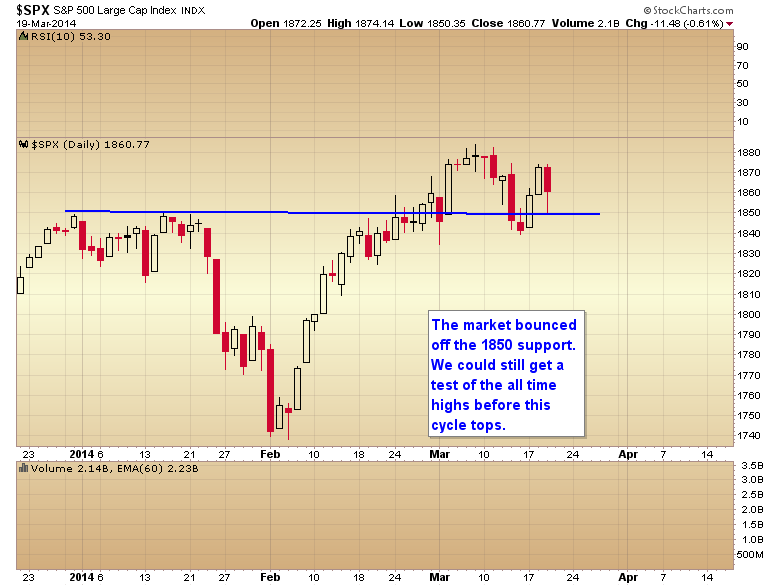 If the intermediate cycle is still advancing this should mark the bottom of the daily cycle decline. We’re going to have to see if this trend line holds through the rest of the day and whether or not we get a swing tomorrow. 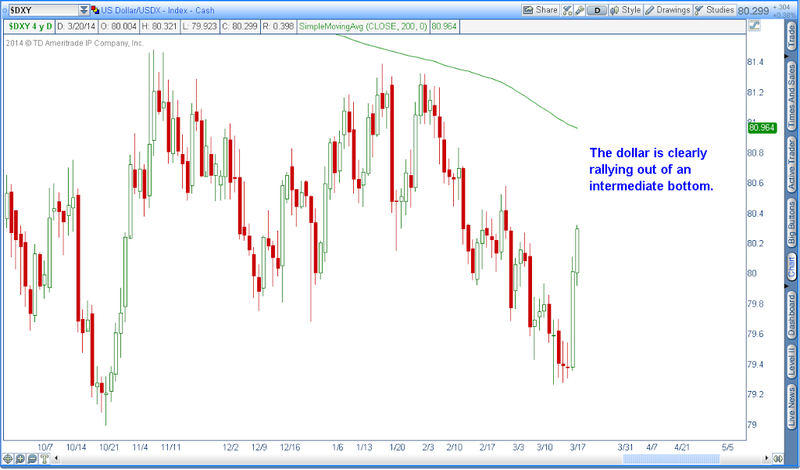 It’s pretty clear today that the dollar has begun a new intermediate cycle. That may or may not force an intermediate top in gold. The knee jerk reaction would be to assume that since the dollar is probably going to rally for a month or more that gold will automatically drop during this period. I’m not going to make that assumption just yet because gold can, and has rallied right along with the dollar from time to time, just like stocks have rallied along with the dollar. All a rising dollar means is that the euro or yen is being printed more aggressively at the moment. It has no bearing on inflation or deflation. 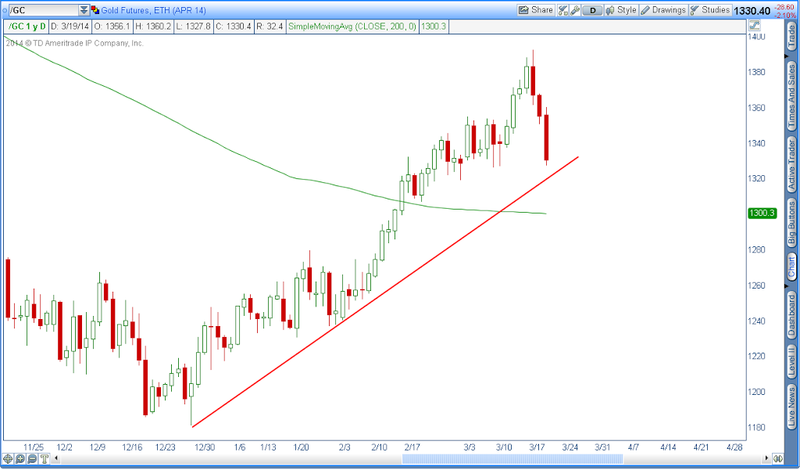 For now we need to see if the trend line holds today and then if gold forms a swing tomorrow despite the dollar rally. I’m not sure what it was the market objected to during Yellen’s press conference but by the end of the day the S&P had bounced off the 1850 support and recovered about half of today’s decline. With options expiration on Friday I have to think this market probably isn’t quite ready to roll over into it’s daily cycle decline just yet. That being said I have no desire to try and catch a few more points only to have them taken right back away when the DCL begins. So for now I’m going to stay in cash in the stock portfolio until stocks drop down into their next DCL. Once that move becomes clear then we will try to spot the bottom and re-enter stock positions as close to the bottom of the DCL as we can. Nothing happening today that we didn’t already expect. Since we didn’t get the reversal candle we now have to wait through Thursday, and probably Friday’s options expiration and see if gold can hang on and hold above the intermediate trend line. If gold does break through that level then we will sell the rest of our positions into the next bounce and go to the sidelines for the next couple of months as the metals would likely become extremely choppy and volatile. Not the kind of market that either bulls or bears can make money in. I certainly would have no desire to try and trade the metals in that environment. If this comes to pass I would suggest folks migrate most of their capital to one of the other portfolios and give the metals a break until May or June. On the other hand if gold completes a swing above the trend line, and a strong move back toward the recent highs ensues then I will look to add exposure to the metal portfolio for one more leg up in this intermediate cycle. 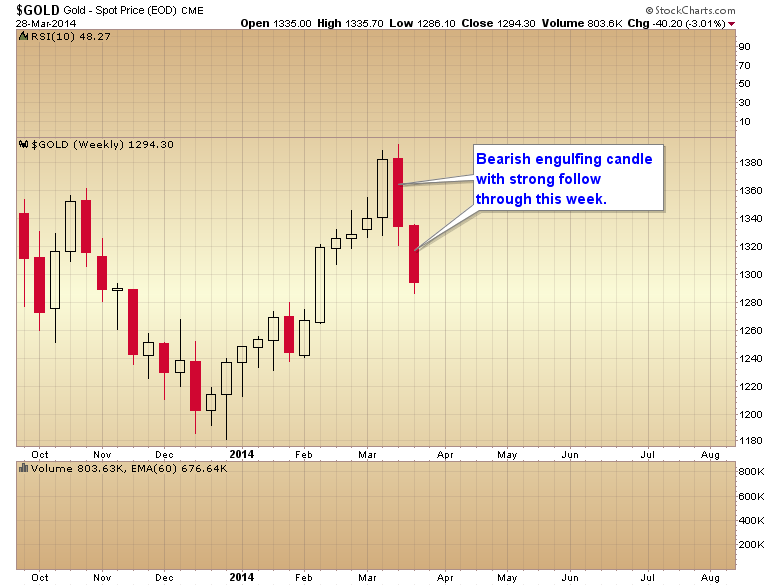 For now though there is nothing to do until gold forms a swing. Finally we come to the dollar. This one is a puzzle. On one hand today’s rally did break the intermediate trend line. It’s late enough in the intermediate cycle that this could end up being a final ICL, and the trend line break would suggest that may be the case. However that would also require us to count two short daily cycles in a row. 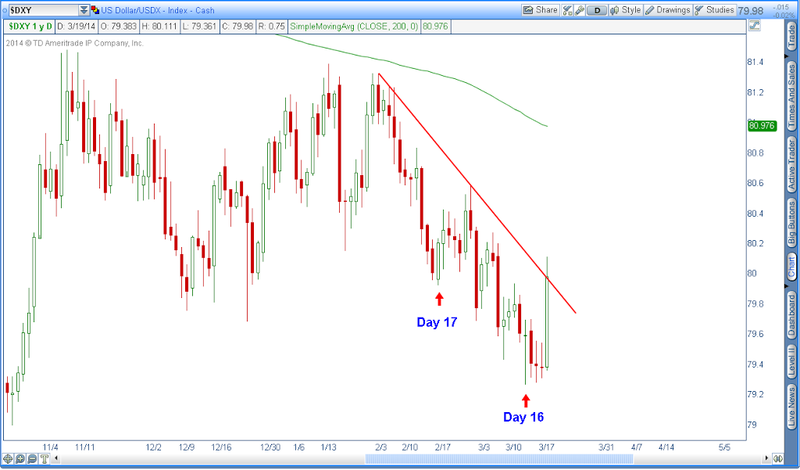 The previous cycle bottomed on day 17 and this one on day 16. Two short cycles in a row would be very unusual. Usually a short cycle is followed by a stretched cycle. So what I’m wondering is will the dollar roll over again quickly and give us one more short cycle with a final bottom around April 4 on the next employment report? We’ll just have to see what transpires tomorrow and Friday before we can make a call on the dollar. This entry was posted in Uncategorized on March 19, 2014 by Gary.